It's not too late to buy the e-commerce juggernaut. This article was updated on Sept. 1, 2017, and originally published on March 12, 2017. 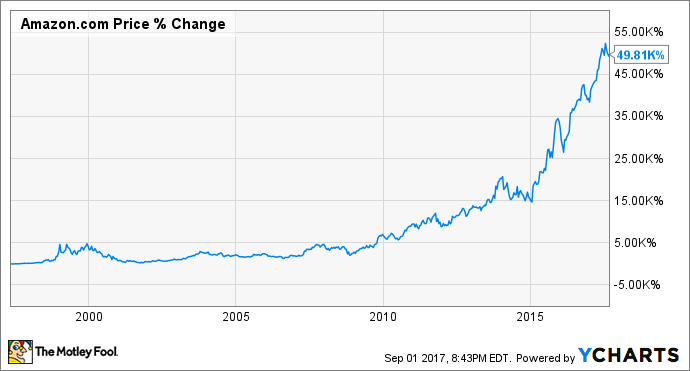 After the company's two decades of torrid growth, you'd be excused for thinking its days of market-crushing gains are a thing of the past. You'd also probably be wrong. In fact, here are three reasons you may want to buy Amazon shares today. That's the percentage of U.S. retail sales conducted offline. 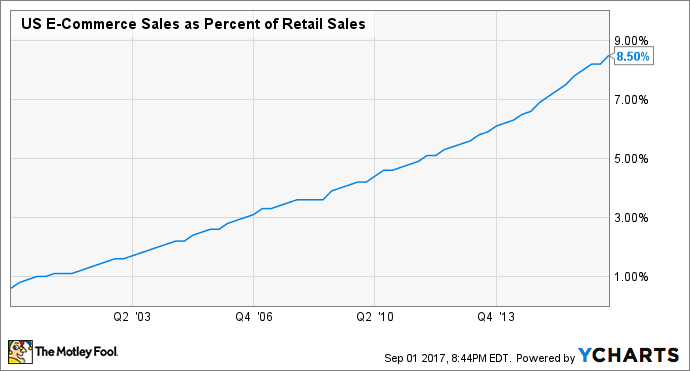 Said differently, e-commerce sales -- even after years of staggering growth -- still comprise less than 10% of retail sales. Research firm eMarketer estimates that global retail e-commerce sales will increase to more than $4 trillion in 2020, up from less than $2 trillion in 2016. With millions more people gaining access to the internet every year, e-commerce appears set to grow at a rapid pace for at least another decade, and probably much longer. Amazon stands to benefit from this megatrend perhaps more than any other company. Amazon is growing increasingly synonymous with the word "shopping" in the minds of consumers. Fifty-five percent of consumers began their search on the retail titan's website when shopping online in September 2016 -- up from 44% a year earlier -- according to a report (opens a PDF) by marketing firm BloomReach. During that time, the share of shoppers whose searches originated at all other retailers' sites combined fell from 21% to only 16%. Amazon is also taking share from search engines. The percentage of customers who began their product hunts on search sites declined to 28% from 34%. These developments haven't escaped the attention of Alphabet (NASDAQ:GOOG)(NASDAQ:GOOGL) subsidiary Google, which has named Amazon its No. 1 competitor. This powerful trend is a testament to Amazon's increasingly dominant consumer mindshare. Moreover, investors should expect these figures to continue their ascent in the coming years, as Amazon's competitors continue to struggle. In addition to its retail search rankings, Amazon's dominance can also be seen in its utter dismantling of traditional retailers. J.C. Penney (NYSE:JCP) closed 127 stores in the second quarter, which represented about 13% of the struggling retailer's store base. J.C Penney Chairman and CEO Marvin Ellison directly acknowledged that the growth of e-commerce was a primary reason for the closures. "We believe closing stores will also allow us to adjust our business to effectively compete against the growing threat of online retailers," Ellison said. Another struggling retailer, Sears Holdings (NASDAQOTH:SHLDQ), plans to close more than 350 Sears and Kmart stores in an effort to cut $1.25 billion in costs in 2017. Sears has been downsizing its store base and selling off many of its most valuable assets in hopes of preserving liquidity and remaining solvent. But in the face of plunging same-store sales, mounting losses, and dwindling cash reserves, Sears Holdings' days appear to be numbered. You can add to this list of besieged retailers Macy's, Kohl's, Abercrombie & Fitch, and Office Depot -- all of which have closed stores in response to the relentless onslaught of the Amazon-led e-commerce revolution. In doing so, a clear picture emerges: Retailers of all types are losing share to the mighty Amazon -- and some may not survive. As its competitors fade away, Amazon stands to claim the spoils. The online retail juggernaut is positioned to capture a huge swath of the rapidly growing global e-commerce market as its rivals crumble by the wayside. In turn, its stock should continue to deliver handsome gains to shareholders in the years ahead. That makes today a great time to buy Amazon.com stock.